Amy Catanzano. Photo courtesy of the artist. There is a fatal flaw in reason. It is the unwavering belief that the arrangement of words into an arithmetic formula will yield indisputable truth - epiphany via syntactical computation. It is a form of cerebral reductionism, or the idea that understanding is limited to a region of the brain or gained through a single process. The last 50 years of cognitive science has proven we are not limited thus, and yet we, in the sciences, continue to resist metarational perspectives to scientific education and process. There are subversive elements in our ranks, however. Academics and artists who are forging different ways of approaching the sciences. One of those people is Amy Catanzano. Amy is a poet, author, and an associate professor of English in Creative Writing at Wake Forest University. 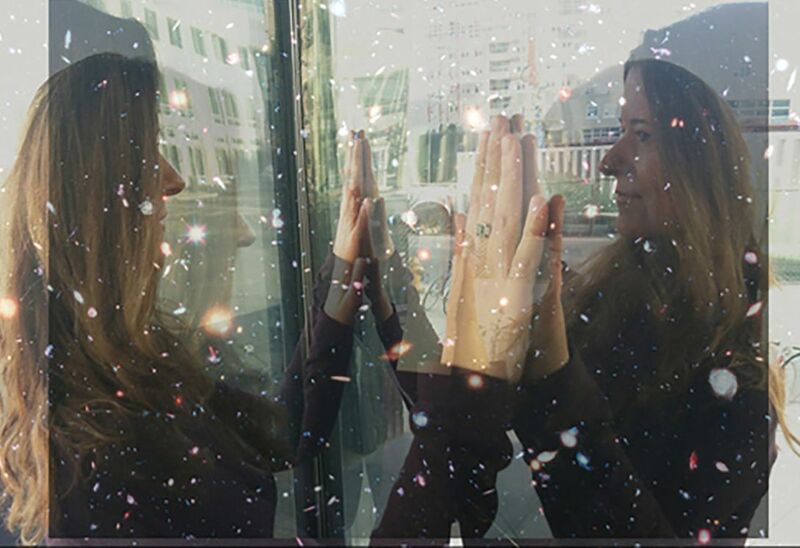 She uses an integrated artistic theory, interpretive framework, and writing praxis called quantum poetics to investigate the intersections of literature, science, and art to reinvent common notions of spacetime, language, and reality. Her journey, perspectives, and works are explored in the interview below. Joe Ferguson: Tell us about your background. What drew you to science? Amy Catanzano: For most of my life as a poet, I have been devoted to subverting convention. Early on, I was influenced by those who defiantly move outside of established boundaries and expectations. I was initially attracted to combining poetry with science as a way of breaking down the notion that imagination and rationality function in opposition to one another. I also found my way to science through science fiction as well as questions I was exploring about space and time. The more I wrote poetry, the more I wanted to explore poetics, the frameworks that inform the reading and writing of poetry. I began studying how space and time operate in relativity compared to how space and time can operate on the page in a poem. I also began studying quantum theory and its principle of indeterminacy in relation to ambiguity and uncertainty in literary aesthetics. My formal education is in poetry writing, literary studies, and Western philosophy. A large part of my practice, however, goes beyond the academic. I use a lot of chance operations, inhuman subject positions, psychedelic dada trickster triple-talk, and experiential experiments in my work. Being a poet has made me curious, which I suppose is also how I found my way to science. And I like to be challenged. Since my only formal education in physics was an accelerated physics course in high school, I began talking to scientists to learn and vet my knowledge in theoretical physics. This led me to visiting scientific research centers to conduct exploratory research. I applied for grants from Wake Forest University and coordinated visits to CERN and elsewhere. There is a long tradition of writers who interact with science, so I began to educate myself on this tradition and those working in it now. Since poetry works with language in unexpected ways, and language is fundamental to thought and knowledge, poetry can intervene in received assumptions about reality. Philosophical questions about the nature of reality also emerge in physics, which aims to understand how the physical universe operates. My work explores how poetry and physics perform these complementary measurements of reality and beyond. 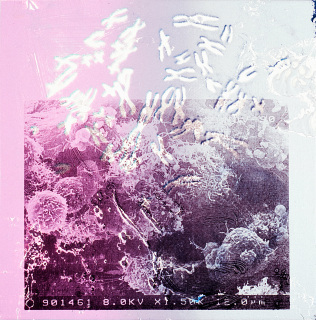 JF: Can poetry be used as a linguistic mechanism for understanding complex scientific systems? AC: Poetry is itself a complex system. This allows poetry to interpret complex scientific systems such as quantum theory that would benefit from a new or modified language and thus more nuanced ways of thinking. For example, it is difficult for many outside of science to visualize how two particles, whose quantum states were once entangled, can interact by instantaneously communicating information after being separated. This is magic to most people. But to scientists, this is quantum mechanics. As a poet trained in the strange, I have no problem accepting the unusual, conceptual dimensions of quantum theory. In fact, quantum theory supports everything I have learned though poetry and lived experience about complexity, uncertainty, and non-binary systems. In quantum entanglement, the time it takes for the entangled particles to interact is at a scale outside of normative language and classical observation. We say entangled particles interact simultaneously, but that is just a concept for describing a timescale that cannot be more imaginatively described. However, in poetry, we can not only describe that timescale, we can enact it. If entanglement could be described with poetic language, then it might appear more understandable but also more complex. This would demonstrate how wondrous physical reality is without received metaphysical explanations. But it takes an artistic approach to language to achieve this depth. Mathematics is a language that can describe phenomena like entanglement. The language that scientists use for talking to broad audiences about science is a translation of mathematics. What would happen if scientists used the full light spectrum of language, including literary form and content, to describe science to broad audiences? They would become poets! Once someone is trained in poetry, they can read and speak in languages that can not only describe but are novel realities. Since poems are new languages, we have to be creative in order to read them. There is no formula. This is one way that reading and writing poetry makes those who do it more creative. Victor M. Blanco telescope. Photo courtesy of the artist. 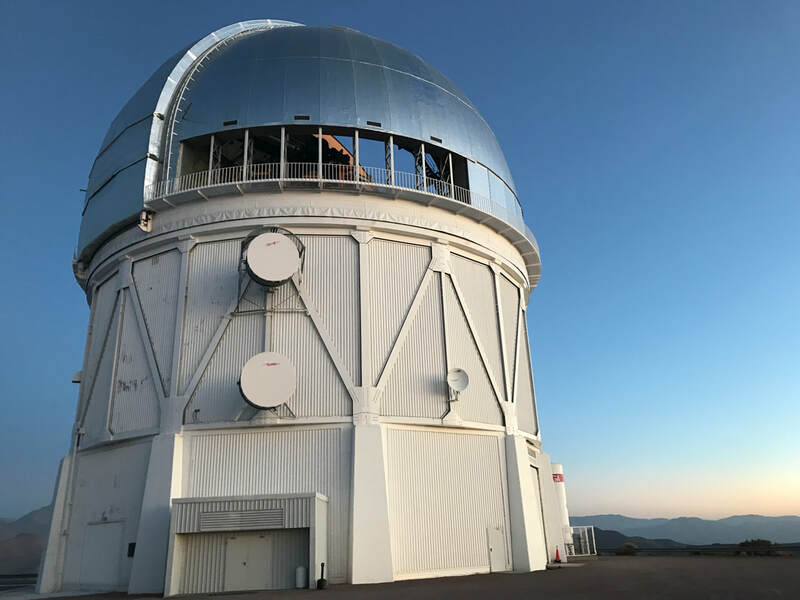 JF: How does a poet find herself in an observatory in the Chilean Andes working with the Dark Energy Survey? AC: My entire poetics is oriented around making such experiences possible. During my time at the Cerro Tololo Inter-American Observatory, I joined Joshua A. Frieman, an astrophysicist affiliated with Fermilab and the University of Chicago and the director of the Dark Energy Survey (DES), and Robert Morgan, a DES researcher and graduate student at the University of Wisconsin in Madison, in the control room of the Victor Blanco 4-meter telescope. They were imaging deep space. Satya Gontcho A Gontcho of the Dark Energy Spectroscopic Instrument project joined us since she was conducting experiments with the telescope after we were done. The scientists were so generous in welcoming me into their work. I loved being part of a team. I felt like the resident poet aboard an intrepid starship of space explorers. The DES scientists are studying the abundance of galaxy clusters, the brightness of distant supernovae, primordial sound waves, and the degree to which light from distant galaxies is bent by gravitational lensing, all of which interact with dark energy. Their research enables them to measure the rate at which the universe has been expanding at different times in the known universe’s history. They have created the most comprehensive cosmic map of dark matter to date. The mission of DES speaks to what is so central to not only much of science but much of art and poetry: humanity’s ambitious drive toward the unknown and what cannot be easily measured by ordinary means. We have long searched for what goes beyond our immediate reach. Some poets, like some scientists, explore what is outside our direct vision. Poets use language outside of normative contexts to engineer a technology, the poem, that, like a telescope, can act as a prosthetic to explore what is not accessible without the poem. Considered through poetic logic, the telescope is a space and time machine, letting our eyes see into the past through space. A poem also can be viewed as an advanced machine of time and space, one that enables us to alternatively travel. After my time in Chile, I spent the next several weeks writing a book-length poem for DES about my experience. I visited the observatory in mid-December of 2018, which is about three months ago. I just learned from Josh the great news that the co-editors of a book on DES will be publishing the first section of my poem. I received a W.C. Archie Endowed Fund for Faculty Excellence grant from Wake Forest to go to the observatory. My visit was first coordinated with Josh. He introduced me to the observatory’s director, Steven Heathcote. My friend and colleague, the intermedia and performance artist Lynn Book, knew Josh and had introduced me to him over email. I was invited to give talks as part of the observatory’s cultural exchange program, one in the telescope and one two hours away in conjunction with the U.S. National Optical Astronomy Observatory. One talk was broadcasted to other observatories in the region. A few weeks ago, I spoke about my experience on a 356 Days of Astronomy podcast. JF: While poet-in-residence at the Simons Center for Geometry and Physics, you wrote World Lines, a poem whose architecture is based on a theoretical model for a quantum supercomputer. How does poetry allow us to understand this theory? AC: Since poetry is the most nimble and radical form of language, it is ideally positioned to contend with the non-binary nature of quantum theory. My poem set out to prove this. In topological quantum computing, pairs of quasiparticles known as anyons are lined up in rows to represent qubits, the quantum bits needed in a quantum computer that can exist as 1, 0, or any quantum superposition of 1 and 0. Each qubit has two anyons that are swapped clockwise and counterclockwise in an intentional order with adjacent anyons, creating a braid. The pairs of the adjacent anyons are measured to produce the output of the computation. The trajectories in time that the anyons make as they are braided are known as world lines. World lines are the historical path that an object traces in the three dimensions of space and the fourth dimension of time. Theoretical physicist Frank Wilczek, who coined the term “anyon,” says that world lines are records of relative motion, a memory of the object moving. At each intersection or tangle of world lines made by the movement of the anyons in a topological quantum computer, a knot can be made from the braiding and by identifying the ends of the world lines. I learned that these quantum knots are thought to be related to the Incan textile known as quipu, connected cords or ropes with knots woven into them. The Inca used quipu as a system for computation. I am familiar with quipu through the Chilean-born poet and artist Cecilia Vicuña, who creates metaphorical iterations of quipu. When I was in Chile for the Dark Energy Survey project, I went to Santiago and saw quipus for the first time at a museum. In Vicuña’s work with quipus, she addresses their destruction during the Spanish Conquest. She says that the quipu “is a poem in space, a way to remember.” Wilczek, in Quanta Magazine, says that topological quantum computing is a modernization of quipu since it is a form of computing with knots. If quipu is a poem in space that offers a way to remember, it functions like a world line, a record of the path of an object as it moves through space in time. Lines of poetry can be viewed as world lines that trace the history of letters moving across the page in time, which provide a meaning and perform a literary gesture, a computation. What parts of a poem could represent the knots in quipu and topological quantum computing? I wondered. 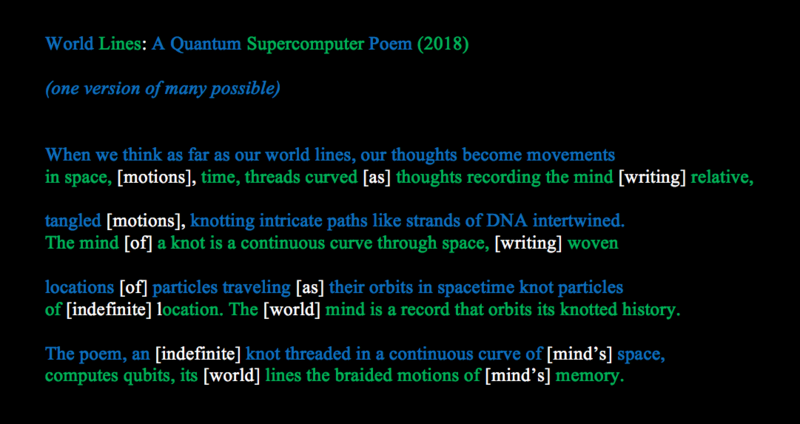 Like the woven knots in quipu and the quantum knots in topological quantum computing, the knots in poetry are sites of complexity, compressing and lengthening the record of the path of the (world) line traveling through space and time. Are quantum knots and quipu knots unacknowledged poetic devices, where the length and breadth of the spacetime of its constituent parts gathers in a compressed moment and location? Image by Catanzano illustrating an early draft of "World Lines," a poem that uses a model of a topological quantum supercomputer. Stony Brook University. 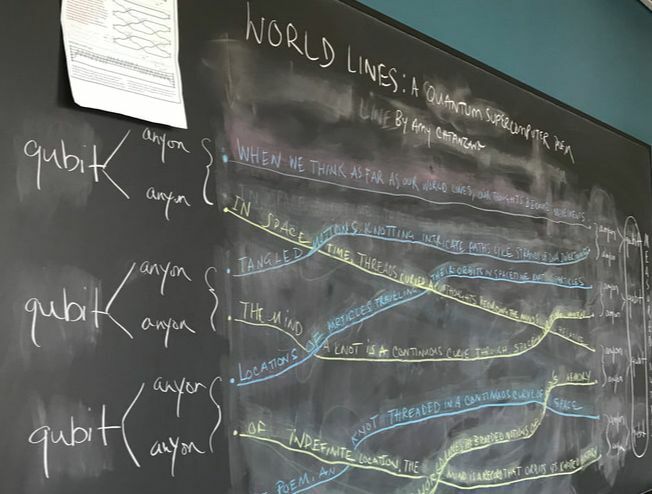 I wrote World Lines on the chalkboard in my temporary office at the Simons Center, making the chalkboard into a circuit board upon which to engineer the poem. In the diagram I used for the model of a topological quantum computer, each qubit has two anyons represented by two world lines, a green one and a blue one. I noticed there was blue and green chalk in my office. Blue and green represent the world of sky, sea, and plants. Seeing the chalk sparked my idea. I realized I could recreate the blue and green world lines in the diagram with the blue and green chalk, but instead of the lines in the diagram, I would draw lines of poetry. This would create four pairs of couplets with eight anyons total. A blue extended line of poetry functions as one world line of the braid, and a green extended line of poetry functions as the other world line of the braid. At the point of intersection where the braiding occurs in my poem, through the action of the quantum knots in the topological quantum computer that evoke quipu, there is a shared word that each line of poetry needs in order to more or less make sense. By connecting the world lines in the poem to perform its computation, the shared words highlight the way that a qubit can exist as a 1, a 0, or any quantum superposition of 1 and 0, unlike a digital bit that can exist only as a 1 or 0. The shared word at each intersection can be a word for the green world line, the blue world line, and both in a quantum superposition of the green and the blue world line. This suggests that the shared word is a site of complexity like the woven knots in quipu and the quantum knots in topological quantum computation. The reader can decide which world line to follow and thus which version of the poem to read. There are many poems inside the poem. Tristan Greene, in an article on the poem at The Next Web, said that until you read the poem, it is several poems at once, like a qubit existing in more than one state at a time. The poem allows us to understand quantum theory by enacting it. One possible version of World Lines. Courtesy of the author. ​JF: Your newest book melds prose and poetry to fluidly navigate some scientifically-challenging material. Tell us about this work. AC: Starlight in Two Million: A Neo-Scientific Novella is an anti-war manifesto and transhuman love story. It has characters named for Greek concepts. It is not about scientific concepts as much as it uses scientific concepts as literary devices. For example, I wrote the book so that the reader could quantum jump while sequentially reading chapter to chapter. In Star Trek, warp drive is achieved not by moving the spaceship really fast but by moving space and time around the spaceship. I see the book as a spaceship that creates a warp speed around it through its literary devices while remaining stationary as an object. The reader must use their imagination to travel through the moving spacetime around the book. Of course, from science we know that both the spaceship and the book are moving in space and time. There is no stasis. The Buddhists know this, too. JF: What works are on the horizon? What can we look forward to? AC: I would love to find a way to go into space as an astronaut-poet. I wonder if any poets will be needed on SpaceX. Dear Elon Musk, if this happens to reach you, please consider me for one of the seats on your spaceship. I will write a poem commemorating the voyage... though I may also critique your Tesla empire. I may also request a Tesla. I may be able to visit Fermilab outside of Chicago and the Kitt Peak National Observatory in Tucson to continue my research of dark energy. It would be exciting to be part of a scientific experiment from the beginning as the poet-in-residence. I want to keep exploring quantum theory and quantum gravity. I am also interested in learning more about string theory, gravitational waves, and more. For those interested in my upcoming or previous projects, my faculty page at Wake Forest is a good resource. This May, I am convening Entanglements: A Conference on the Intersections of Poetry, Science, and Art at Wake Forest. I am bringing together 10 guest poets, scientists, artists, and scholars for presentations and performances. I received an award funded by the Andrew W. Mellon Foundation to convene the conference. A number of people are traveling to the conference. It will be quite the happening. 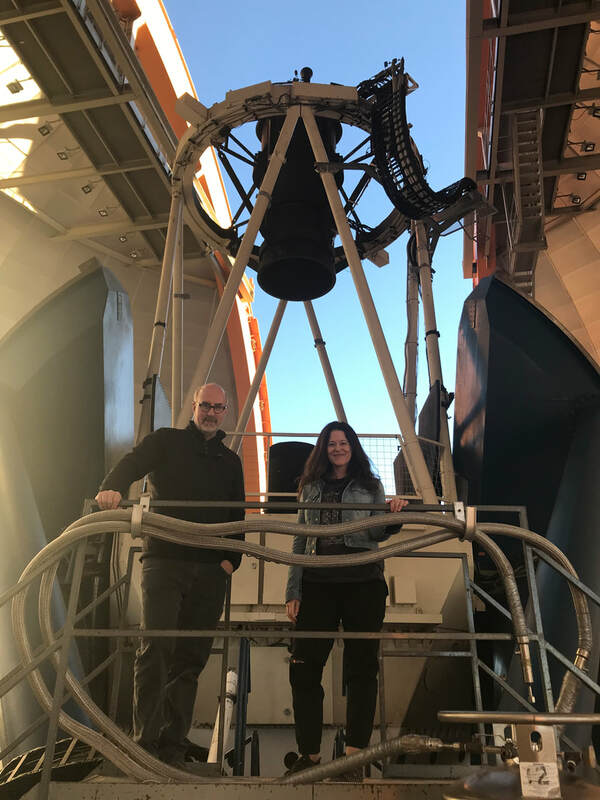 Joshua A. Frieman and Amy Catanzano in the Victor M. Blanco telescope at CTIO in Chile.